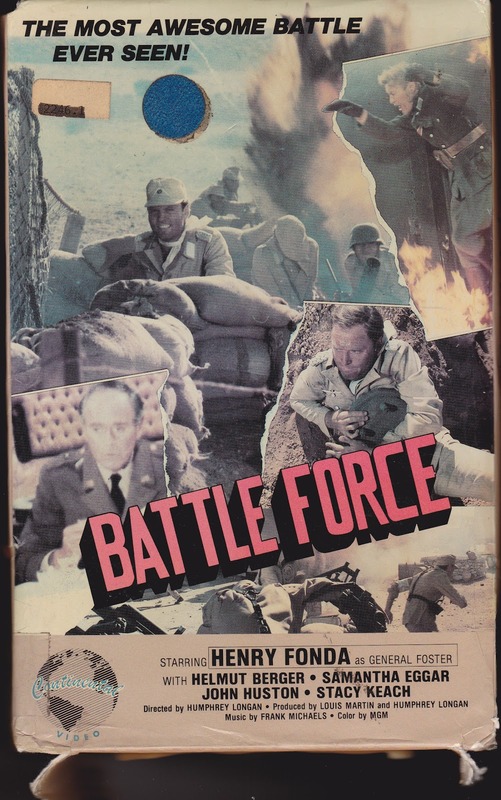 Set during 1942-43 during the prime years of World War II, Battle Force tells many separate tales, but the main two concern Maj. Mannfred Roland (Keach), a Nazi who has fallen in love with a Jewish actress, Annelise Ackermann (Eggar). The fate of their relationship is in limbo as Roland fights in North Africa and can’t be at home in Germany to protect her from the evil Nazis (by comparison, he’s a “good” Nazi). 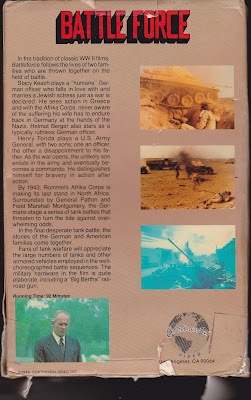 The other story tells the tale of Gen. Foster of the U.S. Army (Fonda). His son John (Lovelock) is something of a screw-up who can’t please his demanding father. So he follows in his footsteps and enlists in the Army. The whole film is narrated by Orson Welles and features a lot of stock footage of the war. Will this truly be “The Biggest Battle” of them all? 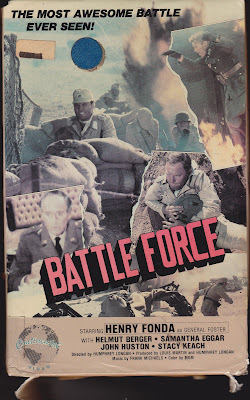 When we originally came across the Continental big-box VHS of this movie, how could we resist it: it’s called Battle Force, and the tagline screams “THE MOST AWESOME BATTLE EVER SEEN!” Plus look at the cast. It’s insane. And we didn’t even have room to mention Orson Welles as the Narrator . How could it lose, right? Well...it’s not that this movie is bad, really, but it’s extremely stodgy and old-fashioned. It seems like the type of Sunday afternoon programmer your grandparents might watch to while away a rainy day. Yes, there is some war action, including some shooting and explosions (giving credit where credit is due, they’re some quality blow-ups), but somehow it’s not really enough. There are way too many cooks in this broth. There’s a ridiculous amount of characters, plus the stock footage and narration, and the result is pretty much a jumble. Which, unfortunately, is not terribly engaging to the audience. We generally love Umberto Lenzi. We think he’s great, but his war movie output (that we’ve seen, anyway) doesn’t seem to rival his poliziotteschi work like Violent Protection (1976) or his classic exploitation horror stuff like Cannibal Ferox (1981), Eaten Alive (1980) or Nightmare City (1980) - not to mention his excellent giallo period of the 1970’s. I wonder what Henry Fonda would think if he knew he was working under the demented genius who created the above titles? Regardless, a direct parallel can be made here: just as the equally-staid WWII drama The Second Victory (1987) is put out by AIP, who is normally known for much wilder and more entertaining fare, so is the case here with the rest of Umberto Lenzi’s work. Why both AIP and Lenzi decided to “go boring” for their WWII jaunts is an interesting coincidence indeed. The movie is well-directed by Lenzi, and it is ambitious and expansive, but there’s no humor whatsoever, and it all comes off as flat and uninvolving. It’s all well and good to play “spot the star” but that’s not really a coherent way to make a movie. Perhaps sensing this, we must quote the writer of the back of the VHS box. 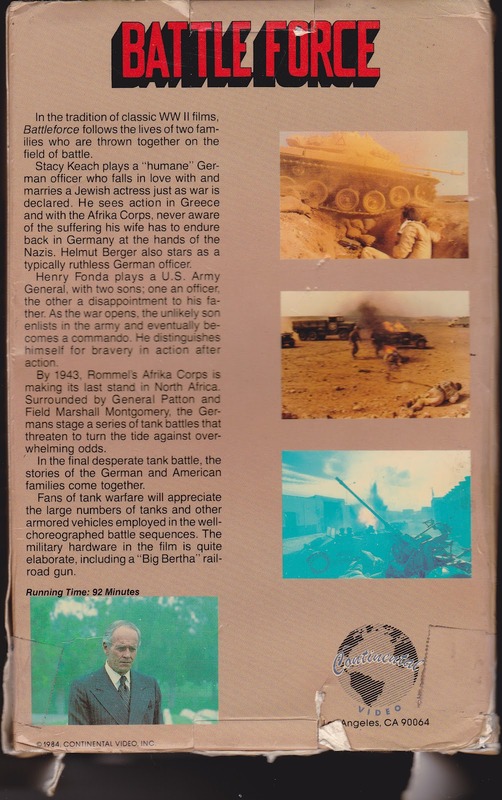 At the very end of a multi-paragraph description, the final pitch to rent or buy this movie to a potential buyer or renter is this: “Fans of tank warfare will appreciate the large numbers of tanks and other armored vehicles employed in the well-choreographed battle sequences. The military hardware in the film is quite elaborate, including a “Big Bertha” railroad gun.” And that’s it. That’s the capper. 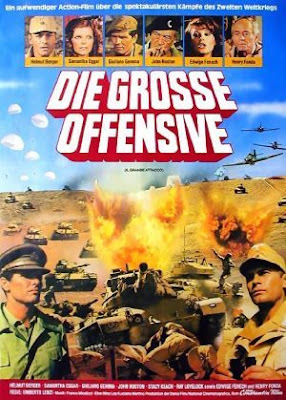 It seems this movie would be the perfect Christmas gift to that member of your family who inevitably is a “fan of tank warfare”. And just the words “Big Bertha” are enough to pique our interest. In the end, it seems only die-hard fans of any of the personalities involved with this project would get much out of Battle Force. Great review of a film that is far from Umberto's best. I'm a fan of his and this ... well, this is best forgotten. I guess I am no fan of tank warfare. Haha, don't beat yourself up, we're no "fans of tank warfare" ourselves. We agree it is not Lenzi's best. People remember his horror work and Battle Force is completely forgotten. Good write up. This one gets heavy rotation on the Movies4Men channel in the UK. I've attempted it a couple of times - mainly because of the cast - but you said it best: flat and uninvolving. Don't waste your time - even if you like films with the word 'Force' in their name. Can't agree more with your comment. This should have been more exciting, but this is the movie equivalent of watching paint dry. What other movies are on that channel?...it seems similar to what we have in the US called Impact On Demand. Agreed. This was Lenzi at his laziest. It need some spark or insanity. Very boring.